You should assume that everything you see or read on this site, including without limitation all text, graphics, downloadable files, information, software and other materials, collectively, the “Content”, is copyrighted. Unless otherwise noted, it may not be used without the written permission of Zip Air Ltd. This means that you may not: “distribute” any of the Content to others without the express written permission of Zip Air Ltd. Communication; “mirror” or “include” any of the Content on your own server or documents without the written permission of Incentevents Ltd. Communication; “modify” or “reuse” any of the Content on this site. You may: print copies of the Content for your own personal use; store the files containing the Content on your own computer for your personal use only; and reference hypertext documents on this server from your own documents. Incentevents Ltd. neither warrants nor represents that your use of Content displayed or downloaded from this site will not infringe rights of third parties not owned by or affiliated with Zip Air Ltd. Your use of and browsing in this site are at your own risk. Neither Zip Air Ltd, any of its agencies, nor any other party involved in creating, producing, or delivering this site is liable for any direct, incidental, consequential, indirect, or punitive damages arising out of your access to, or use of, this site. “As Is” without warranty of any kind, either expressed or implied, including, but not limited to, the implied warranties of merchantability, fitness for a particular purpose, or non-infringement. Zip Air Ltd does not warrant that the functions contained in the materials on the site will be uninterrupted or error-free, that defects will be corrected, or that this site or the server that makes it available are free or viruses or other harmful components. Incentevents Ltd. shall have no liability whatsoever for interruptions on this site, inaccuracies of information or defects on this site regardless of the loss you incur thereby. Zip Air Ltd also assumes no responsibility, and shall not be liable for, any damages to, or viruses that may infect, you computer equipment or other property on account of your access to, use of, or browsing in this site or your downloading of any Content from this site. The content of these paragraphs and their disclaimers and exclusions shall apply to the maximum extent permissible by applicable laws. If you use the links in this website to access other websites, please be aware that the linked sites are not under the control of Zip Air Ltd and Zip Air Ltd is not responsible for and does not endorse their contents. This website may contain links to third party sites. Zip Air ltd is not responsible for the condition or the content of those sites as they are not under Zip Air Ltd.’s control. The link(s) are provided solely for your convenience and do not indicate, expressly or impliedly, any endorsement of the site(s) or the products or services provided there. You access those sites and use their products and services solely on your own risk. The use of a trademark on this site is not intended to indicate any association with or endorsement by the owner of that trademark. We are firmly committed to protecting the privacy and confidentiality of personal information and maintain robust physical, electronic and procedural safeguards to protect personal information in our care. Personal information is information or an opinion, in any form (whether true or not) about an individual whose identity is apparent or can reasonably be ascertained from the information or opinion.How do we collect personal information? Where practical we will collect personal information directly from you. Generally this will be collected by us when you deal with us either in person, by telephone, letter, facsimile, email or when you visit our website. We may request information about you when you purchase or make enquires about our products and services; when you enter competitions, register for promotions or when you request brochures or other information. We may also collect information when we invite you to complete surveys or provide us with feedback. Generally, the type of personal information we collect about you is the information that is needed to facilitate your travel arrangements and bookings and to provide travel services and products to you. For example, we may collect details such as your name, mailing address, telephone number, email address, credit card number and expiry date, passport details, dietary requirements (if any) and health issues relevant to your travel arrangements. We also collect information that is required for use in the business activities of Zip Air Ltd , including for example, financial details necessary in order to process various transactions and any other information you may elect to provide to us. We are required by law to obtain your consent to the collection of sensitive information. We will assume that you have consented to the collection of all information which is provided to us for use in accordance with this Policy, unless you tell us otherwise. How do we use personal information? We will use your personal information to provide you with travel and travel related products and services. We may use and disclose your personal information for the purposes for which it was collected, or for a related or ancillary purpose such as any one or more of the following purposes: Identification of fraud or error; Regulatory reporting and compliance; Developing, improving and marketing our products and services; Servicing our relationship with you by, among other things, providing updates on promotions and services we think may interest you or to involve you in market research and Internal accounting and administration. Is the information disclosed to third parties? We may disclose your personal information: as permitted or required by law; to various regulatory bodies and law enforcement officials and agencies to protect against fraud and for related security purposes; to our third party service providers as well as to our related entities; to third parties such as hotels, transfer companies and other service providers for the purpose for which the information was collected or for a related purpose, for example to facilitate and process your travel arrangements. Where we engage third party contractors to perform services for us those third party contractors may be required to handle your personal information. Under these circumstances those third party contractors must safeguard this information and must only use it for the purposes for which it was supplied, although we are not responsible for ensuring this. Other than the above, we will not disclose your personal information without your consent unless disclosure is either necessary to prevent a threat to life or health, authorised or required by law, reasonably necessary to enforce the law or necessary to investigate a suspected unlawful activity. Zip Air Ltd has implemented appropriate physical, electronic and managerial security procedures in order to protect personal information from loss, misuse, alteration or destruction. Zip Air Ltd reviews security and encryption technologies and will strive to protect information to the fullest extent possible. Access and correction of personal information. Under the Act you have a right of access to the personal information we hold about you. Requests by telephone, fax, or e-mail cannot be accepted. Zip Air Ltd has partnered with reputable third parties to offer our site visitors a variety of products and services. This means that our website may contain links to, or framing of, external web sites. Although we only work with reputable third parties, our business partners may have different privacy policies and practices than us. We are not responsible for the privacy practices or the content of such sites and therefore, make no warranties and accept no liability in relation to material contained on these. We encourage you to read the privacy statements of any linked or framed web site before submitting any personal information. From time to time it may be necessary for us to review and revise this Policy. We reserve the right to change our Policy at any time, should this occur the amendment would be posted on our website. This Agreement and its performance shall be governed by the laws of England and Wales or if you are resident in Scotland, Scots law. You consent and submit to the exclusive jurisdiction of the courts of England and Wales or if you are resident in Scotland, the Scottish courts in all questions and controversies arising out of your use of the site and this Agreement. If you are resident in another member state of the European Union then the law of that member state and the jurisdiction of its courts may apply. If you wish to transfer the travel services to another person this may be permitted by the relevant supplier’s terms and conditions, please contact us should you need to find out any further information in this respect. In the event that any provision in these terms and conditions is determined to be unenforceable or invalid, such provision shall nonetheless be enforced to the fullest extent permitted by applicable law, and such determination shall not affect the validity and enforceability of any other remaining provisions. The following Terms and Conditions shall govern the relationship between the Zip Air Ltd trading as Zip Travel (‘Zip Travel’) and you (‘the client’ ‘you’) on the provision of our tour and travel services. WHAT IS ATOL AND WHAT DOES IT DO FOR ME ? When booking Air-based packages, tickets will not usually be issued straight away. You are entitled by law to receive an ATOL receipt confirming the name and ATOL number of the company. This document is critical to establishing a contract with the ATOL holder and you must ensure you receive it. The ATOL holder will normally issue a second document called a confirmation invoice within two weeks of the booking being made. Again, this is an important document in ensuring that your money is fully protected should the operator goes out of business. If you do not receive the confirmation invoice within two weeks you should chase the company with whom you made the booking. You can contact the Consumer Advice Helpline for further information. The Package Travel, Package Holidays and Package Tours Regulations 1992 require us to provide security for the monies that you pay for the package holidays booked from this brochure and for your repatriation in the event of our insolvency. 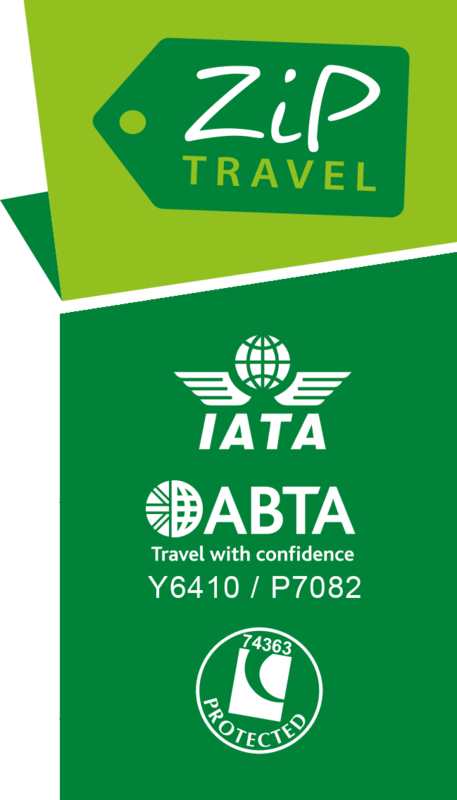 We provide this security by way of an ATOL (number 74363) administered by the Civil Aviation Authority . When you buy an ATOL protected air holiday package and flights from Zip Air Ltd you will receive a Confirmation Invoice from us confirming your arrangements and your protection under our Air Travel Organiser’s Licence number 74363. In the unlikely event of our insolvency, the CAA will ensure that you are not stranded abroad and will arrange to refund any money you have paid to us for an advance booking. For further information visit the ATOL website at www.atol.org.uk. If you confirm tour arrangements offered by Zip Travel we ask you to complete a booking form to be completed and signed as early as possible. The booking form should be returned to Zip Travel together with monies due at time of booking .Please be aware that until a booking is received and payment has cleared Zip Travel cannot make any reservations for your tour unless specified in writing by a member of staff. Once you have signed and returned the booking form you enter into a contract with Zip Travel.On confirming the booking, you are accepting these terms and conditions yourself, and on behalf of persons using the services of Zip Travel. Please ensure that all information on the booking form is complete and accurate, Zip Travel cannot be held responsible for inaccurate booking information. Any changes to your tour within 4 weeks of the departure date must be made in writing to the Zip Travel and cannot be guaranteed. A deposit payment is due at time of booking or full payment is due dependant on when the booking is made. On each booking form for each tour we offer we indicate the payment terms particular to that tour. As a general rule full payment is normally due no later than six – eight weeks before tour departure, however if the tour is booked at short notice then Zip Travel will inform you of the payment terms once agreed. On receipt of a completed booking and we will confirm your arrangements with a confirmation and invoice with details of the tour booked . Your reservation is accepted on the terms of our booking conditions and is valid from the date of confirmation. Any specific terms and conditions relevant to your specific tour will be made available to you at time of booking . If we are unable to accommodate your booking request, we will endeavour to offer you alternative arrangements to suit. If you are unable to accept any alternatives offered at this time, a full refund of all monies paid including deposit will be made. We will try to accommodate any change you are compelled to make, but we cannot promise to do so. If we do, you agree to pay an administration fee and any additional cost of a different arrangement. Please note that an airline may treat a change as a cancellation and create a new booking, charging a 100% cancellation fee. Only the person who signed the booking form may cancel your holiday. Cancellations must be notified in writing and are effective only from the date we receive written notification. To compensate us for the expense of processing your booking, withdrawal from sale at the time of booking and the risk that we may not be able to re-sell the tour we charge cancellation fees in accordance with the following scale. We reserve the right to change travel and tour arrangements. This is necessary because many of our tours involve variables which are outside our control. These include, weather, political issues, currency problems, flights and accommodation issues , changes to events schedule. We shall tell you about small changes before departure. If we think a necessary change is important, we will tell you about it as soon as we can and give you the opportunity to either accept the change, or take an alternative holiday (paying or receiving a refund / credit in respect of any price difference), or cancel and accept a full refund. If such problems occur during a tour, we will make alternative arrangements so as to comply as closely as possible to the description of the tour in our brochure. If a problem occurs which is so serious that we have to cancel a tour before the date of departure, you may choose to accept either an alternative holiday (paying or receiving a refund/credit in respect of any price difference) or a full refund of all money paid. In certain cases we may pay compensation too, at our discretion. unusual and unforeseeable circumstances arise which are beyond our control, the consequences of which we could not have avoided even with all due care; or the change is not significant. We are not liable to pay you any additional travel or any other costs, expenses or losses which you incur as a result of any change or cancellation by us, such as changes to times of connecting flights or other travel arrangements. We reserve the right to cancel any Tour, for which there are not enough bookings, not less than four weeks prior to departure. In the event of our cancellation, your deposit (and any other payment you may have made to us) will be refunded in full, or, if you prefer, transferred to an alternative Butterfly Holiday. You agree that all these provisions are reasonable. Arrangements for tours are often made many months in advance. Whist the Company will always endeavour to satisfy the tour itinerary, Zip Travel will not be liable for any change of plans or alterations to the tour itinerary caused by factors beyond its control including (but not limited to) cancellation of an event or fixture ( not limited to sports events or fixtures ), the adverse weather conditions, political unrest, acts of terrorism, disruption of scheduled transport services, strike, Civil Aviation Authority, local authority or police restrictions. Indicative flight times and check-in times are shown on the website but please note these are subject to change and are for guidance only. Actual flight times will be shown on your flight tickets. We advise that you must check your flight times when you receive your tickets. Your flight tickets will show your baggage allowance. If you require any further information on baggage allowance please contact the airline. Single rooms are normally available at an extra cost. However, if you so wish, it may be possible for you to share a room. All cancellations of group of individual tour member must be made in writing by the tour organiser and sent to Zip Travel at the address below. On each booking form for each tour we offer we indicate the cancellation charges particular to that tour. If Zip Travel is unable to provide the reserved tour arrangements the Incentevents Ltd will notify the Customer as soon as possible. Following cancellation by the you as the client or Zip Travel the client can either have a refund of all monies paid or accept an offer of alternative travel arrangements of equivalent standard from Zip Travel. if available, or a choice of specified travel arrangements of a lower standard to those booked together with a refund of the difference in price. All tours are operated subject to a minimum number of participants and if there is insufficient demand for any tour offered the Company reserves the right to cancel the reservation without further liability and refund to the Customer any monies paid to the Company. The Company books flights in good faith but has no direct control over the manner in which these services are provided and it therefore accepts no liability for airline schedule changes and any consequences resulting there from. Prices in the Zip Travel brochure, on the website or quoted to you are correct at the time of publication. Zip Travel reserves the right to change these prices due to increases in costs of products or services. We will however absorb up to 2% of any increase in price of the tour and will not impose surcharges less than 2 weeks before tour departure. Zip Travel try to ensure that we exceed your expectations in every area of your tour arrangements, however if you have any suggestions or even a complaint please do inform us in writing at the end of your tour. If your problem is whilst you are on tour then please bring it up with the Zip Travel representative or directly with the agent or supplier (coach company, hotel manager etc). As our client it is your responsibility to ensure you have the appropriate documentation required to travel. This includes passports, Visa’s if required, EHIC (E111 equivalent) plus any insurance documentation amongst others. Please leave at least 10 weeks to obtain all these documents. Any specific requirements regarding Passport, Visa, Insurance or Health is appropriate to a particular tour will be made available on the tour summary details. Please mention at time of enquiry whether any members of your group have any special needs or requirements including physical, dietary or any other. You should contact a doctor if you are in doubt about your fitness to travel. For more advice visit www.fco.gov.uk and visit your local Post Office to obtain a copy of ‘Health Advice for Travellers’. On confirming you arrangements you accept responsibility for the behaviour of yourself and your touring party for the duration of the tour. If the behaviour of any of your tour party is deemed unacceptable by Incentevents Ltd staff, suppliers or agents we reserve the right to terminate your tour without refund. Incentevents Ltd will be entitled to recover from the touring party the costs of any damage or loss to Zip Travel or our suppliers and agents, caused by the group. In operating as a Conference and Event Organisor, Tour Operator or Travel Agent Zip Travel hold Liability and Professional Indemnity Insurance effected through Nexus. Details of the policy are available on request. Personal information is information or an opinion, in any form (whether true or not) about an individual whose identity is apparent or can reasonably be ascertained from the information or opinion. How do we collect personal information? We also collect information that is required for use in the business activities of Incentevents ltd , including for example, financial details necessary in order to process various transactions and any other information you may elect to provide to us. We are required by law to obtain your consent to the collection of sensitive information. We will assume that you have consented to the collection of all information which is provided to us for use in accordance with this Policy, unless you tell us otherwise. We will use your personal information to provide you with travel and travel related products and services. We may use and disclose your personal information for the purposes for which it was collected, or for a related or ancillary purpose such as any one or more of the following purposes: Identification of fraud or error; Regulatory reporting and compliance; Developing, improving and marketing our products and services; Servicing our relationship with you by, among other things, providing updates on promotions and services we think may interest you or to involve you in market research and Internal accounting and administration. In providing our services to you it may be necessary for us to forward personal information to relevant overseas third party service providers. Please let us know if you have any objections to such transfers. Changes to our PolicyFrom time to time it may be necessary for us to review and revise this Policy. We reserve the right to change our Policy at any time, should this occur the amendment would be posted on our website. Your contract is made under these booking conditions and this Fair Trading Code and is subject to English Law and jurisdiction and it is agreed between both parties that each will submit to the jurisdiction of the English Courts. Zip travel is an independent ABTA/IATA/ATOL licenced travel management company with a focus on providing good old fashioned service. Established in 1993 by experienced travel professionals we offer the very best in corporate , sports & leisure travel management solutions. For full details please click here. Zip Travel is a trading name of Zip Air Ltd.
Foreign and Commonwealth Office travel advice. It’s always best to be up to date with the latest travel advice concerning the country you’re visiting. To check with the Foreign and Commonwealth Office Travel Advice Unit please click here you can also keep updated via @FCOtravel and facebook.com/fcotravel.